Juvéderm™ is a “next generation” dermal filler from Allergan Inc. offering dramatic results for those unhappy with the early signs of aging. The smooth consistency of Juvéderm™ delivers a natural look and feel that can last up to six months. It is a non-surgical method to smooth out facial lines and wrinkles, plump up lips, and fill in scars with minimal discomfort. The results are immediately noticeable – a refreshed and more youthful appearance. Dr. Soe has a special interest in Cosmetic Dermatology and has completed advanced training in Juvéderm™. Her office in Dunedin offers Juvederm™ for Palm Harbor, Clearwater and surrounding areas. Juvéderm™ is the only HA filller with FDA approval to last up to one year. Ask your physician how you can get long-lasting results with Juvéderm™. * Juvéderm™ is indicated for injection into the mid to deep dermis for correction of moderate to severe facial wrinkles and folds (such as nasolabial folds). What is Juvéderm™ indicated for? Juvéderm™ Ultra and Juvéderm™ Ultra Plus injectable gels are indicated for injection into the mid to deep dermis (below the outer layer of skin) for the correction of moderate to severe facial wrinkles and folds, such as nasolabial folds (the creases running from the bottom of your nose to the corners of your mouth, aka smile lines or parentheses). Juvéderm™ is the ONLY hyaluronic acid (HA) filler FDA approved to last up to 1 year. Our unique manufacturing process provides a high concentration of cross-linked hyaluronic acid for long-lasting results. It also works to create a smooth consistency gel that flows easily into the skin and provides a smooth, natural look and feel. All other hyaluronic acid dermal fillers currently on the market are made of granular consistency gels. And, Juvéderm™ is the first hyaluronic acid dermal filler that has demonstrated its safety and effectiveness in persons of color. How is Juvéderm™ injectable gel different from BOTOX® Cosmetic? Juvéderm™ injectable gel is a “next-generation” hyaluronic acid dermal filler that provides volume and is used to treat wrinkles and folds resulting from a loss of volume beneath the surface of the skin such as perioral lines and nasolabial folds (lines around your mouth and nose). Juvéderm™ restores your skin’s volume for a smooth, natural look and feel. BOTOX® Cosmetic is not a filler. BOTOX® Cosmetic relaxes muscle activity and is used to treat moderate to severe lines caused by the dominant frown muscles between the eyebrows (the glabellar area). This allows the two vertical lines between the brows, often referred to as the “11,” to temporarily diminish for a smoother appearance. For important safety information about BOTOX® Cosmetic, see below. What is cross-linked hyaluronic acid? “Uncross-linked” hyaluronic acid in its natural form is in a liquid state. “Cross-linking” is the process through which hyaluronic acid is made into a gel product that can be injected into the skin for long-lasting results. How is Juvéderm™ injectable gel used in treatment? Your healthcare provider eases Juvéderm™ injectable gel into the skin using a fine needle to temporarily fill in and augment the treatment area and smooth moderate to severe facial wrinkles and folds such as “smile lines” or “parentheses” (nasolabial folds) and “marionette lines” (oral commissures). Juvéderm™ temporarily adds volume to the skin and may give the appearance of a smoother surface. Juvéderm™ injectable gel will help to smooth moderate to severe facial wrinkles and folds. Most patients need one treatment to achieve optimal wrinkle smoothing. And one treatment could smooth your lines and wrinkles for up to 1 year. Ask your doctor what you should expect from your initial treatment and when they would recommend rescheduling another appointment. Is treatment with Juvéderm™ injectable gel painful? Injections may cause some discomfort during and after the injection. 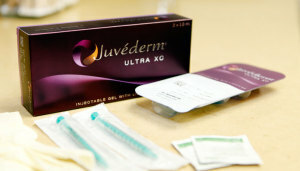 The smooth consistency gel of Juvéderm™ allows your doctor to administer it easily and smoothly. And, Juvéderm™ is injected directly into the skin using a fine needle to reduce injection discomfort. Your doctor may choose to numb (anesthetize) the treatment area to further minimize discomfort. What kind of doctor can provide treatment with Juvéderm™ injectable gel? Any authorized healthcare professional can administer Juvéderm™ injectable gel, but dermatologists, plastic surgeons, ophthalmologists, otolaryngologists (ear, nose, and throat doctors), or physicians specializing in cosmetic procedures are generally more experienced. No. Correction is temporary; therefore, touch-up injections as well as repeat injections are usually needed to maintain optimal corrections. Juvéderm™ is the ONLY hyaluronic acid (HA) filler FDA approved to last up to 1 year. *Juvéderm™ is indicated for injection into the mid to deep dermis for correction of moderate to severe facial wrinkles and folds (such as nasolabial folds). What are the possible side effects of Juvéderm™ injectable gel? Yes. In fact, Juvéderm™ injectable gel is the first FDA-approved hyaluronic acid dermal filler that has proven its safety and effectiveness in persons of color. Studies with Juvéderm™ showed no increased risk of hyperpigmentation or hypertrophic scarring in patients of color. To schedule a consultation or appointment, call us at 727.734.4551.